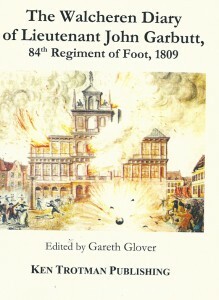 In my little crusade to publish as many Napoleonic memoirs as I can find, I often receive messages from individuals who are lucky enough to have such a journal or diary in their possession which has been carefully preserved and handed down through the generations, but the short journal written by Lieutenant John Garbutt came to my notice by a more dramatic route which highlights the importance of publishing these valuable accounts before many are lost forever; for even a number of those held by archives throughout Great Britain are in a parlous state or the ink has faded almost beyond recognition. In this case, I was contacted via e-mail by Richard Pearson a few years ago asking if I would be interested in seeing the journal of one John Garbutt. This small leather bound journal had been retrieved a few years earlier by his wife who luckily happened to notice it in passing among the junk thrown into a skip during the clearance of an old bank in Yorkshire! Her inquisitiveness saved it by a hair’s breadth from being lost forever in some land fill site. Because of both our busy lives however it has proven complicated for Richard and I to meet until I took the opportunity of a trip to Cambridge, to meet Richard at his offices in Norwich, where he kindly allowed me to photograph the original, to prepare it for publication. John Garbutt was the son of Mr John Garbutt of Kirby Moorside in Yorkshire, he only joined the 3rd West Yorkshire Militia as an ensign on 31 March 1808, but only six weeks later the London Gazette records that on 18 May 1808, he transferred to the 84th Foot from the 3rd Battalion West York Militia as an ensign. Only four months later on the 13 September John was gazetted as a Lieutenant in the 2nd Battalion of the same regiment. The 84th Foot or ‘York and Lancaster’ Regiment was raised again in 1793 with the advent of the wars against revolutionary France. This single battalion regiment had served in Walcheren in 1794 and had then sailed to the Cape of Good Hope in 1796 and on to India in 1798. By 1807-8, the army required further regiments to achieve all of its commitments and a number of second battalions were formed, initially to be used as a depot and resupply unit for the 1st battalions. However, because of these demands, soon a number of 2nd battalions were being committed abroad as well. The 84th was ordered to form a 2nd battalion at the end of 1807, which took until the spring of 1808 before it was complete. It was therefore at its very inauguration that John Garbutt joined the battalion commanded by Lieutenant Colonel Richard Lloyd. It was not until the following year on 15 July 1809 when 2/84th consisting of 864 men all ranks marched from their barracks at Colchester to Harwich to embark on the Duke of York’s ‘Great Expedition’. The government had always been jealous of the French occupation of the Low countries and Antwerp with its great port particularly. Here Napoleon had built a large fleet and he attempted to develop Antwerp’s trade in an attempt to overshadow London. At the same time, war was rapidly looming between France and Britain’s ally Austria. An attack in the rear of the French army would hopefully divert some of the French troops from the attack on Austria, thus aiding their ally. Thus the ‘Great Expedition’ was inaugurated under the command of the Earl of Chatham ‘to render the river un-navigable for ships of war’. The 2/84th was to form part of the right wing in the 3rd Division commanded by Lieutenant General Thomas Grosvenor in Brigadier General Acland’s Brigade. At dawn on Friday 28 July the enormous fleet of over 200 transports and the protecting Royal Navy ships set sail for the Scheldt carrying an army of 38,000 men. Bad weather prevented immediate landings but an attempt was made on the more sheltered northern coastline of Walcheren Island. Naval gunboats armed with cannon preceded the ‘flats’ or shallow draught landing craft which were precariously filled with soldiers in full kit and towed to shore by the ship’s boats. The landing was a complete success with only light casualties and within hours the nearby town of Middleburgh had succumbed. Grosvenor’s Division did not disembark until 2 August at Campvere to assist in the siege of Flushing, the main town in the island. The 2/84th then took their integral part in the siege operations, as an outlying picquet and often providing infantry support for the siege artillery, a tedious but quite dangerous duty. Here John Garbutt’s journal can take over the story. His short but very interesting journal was often written whilst actually sitting out on the outlying picket for the army and whilst actually under fire! The immediacy of these near misses certainly brings it to life and one can almost imagine being sat with him under fire from both musket and cannon. The second part of his journal is filled with the sixty-two flag combinations set for use during the amphibious landings. These were issued when the fleet sailed for the Scheldt and give an excellent idea of the complicated signals that could be easily transmitted to all units and quickly understood and acted upon, an essential part of any landing. During forty years of study of the Napoleonic wars I had never seen a copy of these signals for the army personnel and landing boats until I discovered and published the journal of Lieutenant George Bourne of the 85th Foot, in 2006. John Garbutt’s copy is identical to that of Bourne, confirming that the code was universal throughout the expedition (the 85th forming part of the left wing and thus entirely separate to the 84th). The invaluable addition to our knowledge in Garbutt’s copy is that on his return to Britain, he took the opportunity to hand colour the various flags in, something that Bourne did not do. From this I have been able to confirm that they do not conform to the numbered flags in the present Naval code. In fact they can now be identified as those used in Howe’s and Popham’s Signal systems as 1-9 and 0 (the 0 flag in both Garbutt’s and Bourne’s version is recorded as denoting 10). Although a short account, it has much vibrancy and the naval signal’s are of great interest being more complete than any other I know. I am therefore very pleased and proud to be able to do my bit to save them for posterity.